Our first pylon race of 2007 featured wonderful foamy warbirds raced by Steve Cole, Adam Clement and Merle McGregor. Check out this short video clip, Steve on the sticks with September Fury on the inner leg of the pylon course, Adam turning on the north pylon. Video courtesy of Jon Stychno. Our thanks go out to the field cleanup crew who got together Sunday to bring the field into tip top shape for the busy event season ahead of us. 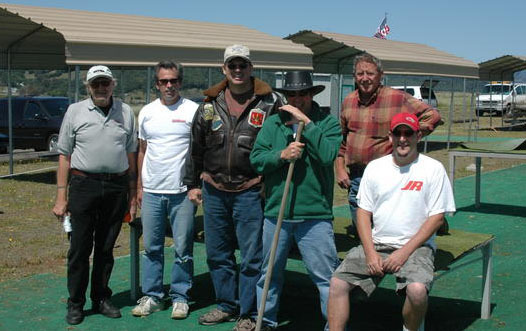 Among the crew were Sid Maxwell, Steve Cole, Brian Blackburn, Bryan Germone, Merle McGregor and Adam Clement. Thanks to Merle for providing the group shot. We are not enabling general member registration at this time. You are restricted to browsing the forum and the gallery. Before our next member meeting we will turn on registration and send club members an email notification. 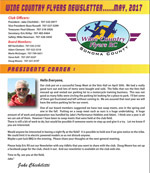 Welcome the the new online home of the Wine Country Flyers. The site has been completely re-built using some great open source tools. An Event Calendar to keep you informed of club events throughout the flying season. Once you sign up you will be able to contribute to or start a discussion on the forum and we will also give you an album in the member area of the gallery. The current gallery is made up of a club area and a member area, browse the club area to get an idea of how the system works. If you have suggestions, problems or questions, please drop us a line. We hope you enjoy the new functionality.